More than two generations have passed since oil transformed the economies and societies of the Gulf monarchies. Gulf citizens enjoy opportunities unimaginable without oil wealth and have the security of a comprehensive welfare state. But how sustainable are the Gulf economies? Citizen populations continue to grow, oil reserves continue to fall, technological advances could lessen world demand for the Gulf’s oil, and price fluctuations make planning difficult. Most Gulf monarchies have made little progress in transitioning away from oil despite these widely-recognized incipient problems. Periods of lower oil prices are met with deficit spending until prices rise again, rather than serious economic restructuring. They have built economies with deep structural imbalances that make it more rather than less difficult to reduce their reliance on oil – and political orders which are deeply constituted by those imbalances and threatened by reform. The political economies shaped by oil wealth have been primarily studied in the political science literature through the concept of the rentier state, which suggests that the dominance of oil wealth has distinctive, largely unavoidable political, social, and economic effects. Rentier state theory developed to explain the difficulty of diversifying economies, the bloating and inefficiencies of state institutions, the absence of democracy, the power of national security states, and patriarchal political cultures. Among scholars whose work focuses on the Gulf, though, the theory of the rentier state appears more often as a foil than as a bedrock theoretical perspective. Does rentier state theory actually explain political outcomes and structures in the Gulf? The contributions and limitations of rentier state theory in the Gulf were the focus of a workshop convened by the Project on Middle East Political Science at the Elliott School of International Affairs in September 2018. The discussions among a diverse, interdisciplinary set of scholars revolved around the nature and extent of the coming challenges to Gulf economies, and the inadequacy of existing theories of the rentier state to account for the political implications. 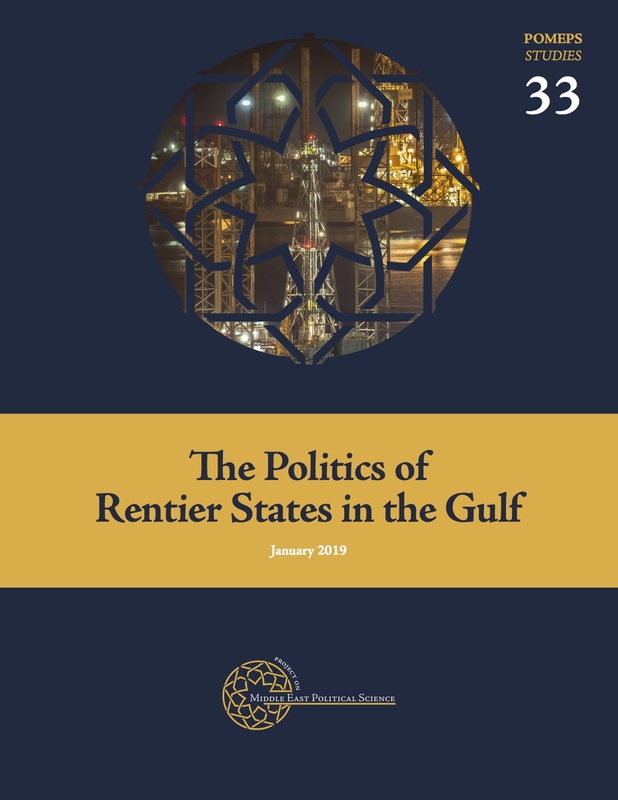 The papers presented in POMEPS Studies 33: The Politics of Rentier States in the Gulf range widely across countries, economic sectors, and political manifestations and bring anthropological and ethnographic perspectives into dialogue with economists and political scientists.